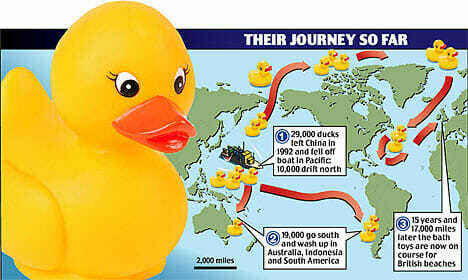 While the ducks are undoubtedly a loss to the bath-time fun of thousands of children, their adventures at sea have proved an invaluable aid to science. The toys have helped researchers to chart the great ocean currents because when they are spotted bobbing on the waves they are much more likely to be reported to the authorities than the floats which scientists normally use. Mr Ebbesmeyer saw immediately how valuable the little toys would be to scientific research of the great ocean currents, the engine of the planet’s entire climate. He correctly predicted what many thought was impossible – that thousands of them would end up washed into the Arctic ice near Alaska, and then move at a mile a day, frozen in the pack ice, around their very own North-West Passage to the Atlantic. It proved true years later and in 2003, the first “Friendly Floatees” were found, frozen and then thawed out, on the eastern seaboard of the U.S. and Canada. So precious to science are they that the US firm that made them is offering a £50 bounty for finding one.